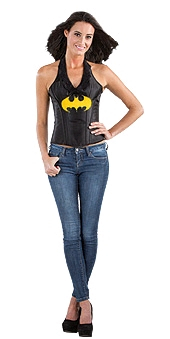 This sleek and stylish halter top Batgirl corset with yellow bat logo will transform any outfit into a SUPER outfit! Who needs a party to go to when you can wear this corset for any occasion! Batgirl has never been more versatile. Pop it on with a pair of jeans and you can save the city or hit the club!